StarCraft II Deep Reinforcement Learning Agent. Modular DRL framework. Works with Gym, Atari, and MuJoCo as well. Reaver is a modular deep reinforcement learning framework with a focus on various StarCraft II based tasks, following in DeepMind's footsteps who are pushing state-of-the-art of the field through the lens of playing a modern video game with human-like interface and limitations. This includes observing visual features similar (though not identical) to what a human player would perceive and choosing actions from similar pool of options a human player would have. See StarCraft II: A New Challenge for Reinforcement Learning article for more details. Though development is research-driven, the philosophy behind Reaver API is akin to StarCraft II game itself - it has something to offer both for novices and experts in the field. For hobbyist programmers Reaver offers all the tools necessary to train DRL agents by modifying only a small and isolated part of the agent (e.g. hyperparameters). For veteran researchers Reaver offers simple, but performance-optimized codebase with modular architecture: agent, model, and environment are decoupled and can be swapped at will. While the focus of Reaver is on StarCraft II, it also has full support for other popular environments, notably Atari and MuJoCo. Reaver agent algorithms are validated against reference results, e.g. PPO agent is able to match Proximal Policy Optimization Algorithms. Please see below for more details. NB! PySC2 PIP version is outdated, so you will need to install it from source as described above. By installing with -e flag Python will now look for reaver in the specified folder, rather than site-packages storage. The TensorFlow that is distributed through PIP is built to target as many architectures / devices as possible, which means that various optimization flags are disabled by default. For example, if your CPU supports AVX2 (is newer than 5 years), it is highly recommended to use a custom built TensorFlow instead. If building from source is not an option for you, then this repository might be useful - it contains newest TensorFlow releases built for newest CUDA / CuDNN versions, which often come with performance boosts even for older GPUs. Please see the wiki page for detailed instructions on setting up Reaver on Windows. However, if possible please consider using Linux OS instead - due to performance and stability considerations. If you would like to see your agent perform with full graphics enabled you can save a replay of the agent on Linux and open it on Windows. This is how the video recording listed below was made. You can train a DRL agent with multiple StarCraft II environments running in parallel with just four lines of code! Moreover, Reaver comes with highly configurable commandline tools, so this task can be reduced to a short one-liner! With the line above Reaver will initialize the training procedure with a set of pre-defined hyperparameters, optimized specifically for the given environment and agent. After awhile you will start seeing logs with various useful statistics in your terminal screen. Reaver should quickly converge to about 25-26 RMe (mean episode rewards), which matches DeepMind results for this environment. Specific training time depends on your hardware. Logs above are produced on a laptop with Intel i5-7300HQ CPU (4 cores) and GTX 1050 GPU, the training took around 30 minutes. After Reaver has finished training, you can look at how it performs by appending --test and --render flags to the one-liner. A companion Google Colab notebook notebook is available to try out Reaver online. Many modern DRL algorithms rely on being executed in multiple environments at the same time in parallel. As Python has GIL, this feature must be implemented through multiprocessing. Majority of open source implementations solve this task with message-based approach (e.g. Python multiprocessing.Pipe or MPI), where individual processes communicate by sending data through IPC. This is a valid and most likely only reasonable approach for large-scale distributed approaches that companies like DeepMind and openAI operate on. However, for a typical researcher or hobbyist a much more common scenario is having access only to a single machine environment, whether it is a laptop or a node on a HPC cluster. Reaver is optimized specifically for this case by making use of shared memory in a lock-free manner. This approach nets significant performance boost of up to 1.5x speed-up in StarCraft II sampling rate (and up to 100x speedup in general case), being bottle-necked almost exclusively by GPU input/output pipeline. The three core Reaver modules - envs, models, and agents are almost completely detached from each other. This ensures that extending functionality in one module is seamlessly integrated into the others. All configuration is handled through gin-config and can be easily shared as .gin files. This includes all hyperparameters, environment arguments, and model definitions. Human Expert results were gathered by DeepMind from a GrandMaster level player. DeepMind ReDRL refers to current state-of-the-art results, described in Relational Deep Reinforcement Learning article. DeepMind SC2LE are results published in StarCraft II: A New Challenge for Reinforcement Learning article. Reaver (A2C) are results gathered by training the reaver.agents.A2C agent, replicating SC2LE architecture as closely as possible on available hardware. Results are gathered by running the trained agent in --test mode for 100 episodes, calculating episode total rewards. Listed are the mean, standard deviation (in parentheses), and min & max (in square brackets). Samples refer to total number of observe -> step -> reward chains in one environment. Episodes refer to total number of StepType.LAST flags returned by PySC2. Approx. Time is the approximate training time on a laptop with Intel i5-7300HQ CPU (4 cores) and GTX 1050 GPU. 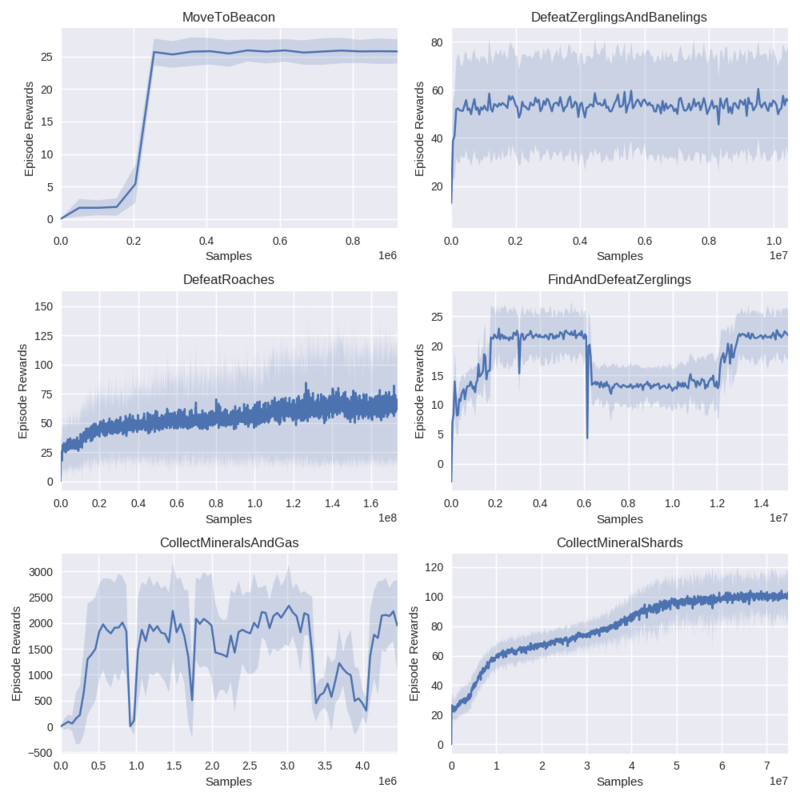 Note that I did not put much time into hyperparameter tuning, focusing mostly on verifying that the agent is capable of learning rather than maximizing sample efficiency. For example, naive first try on MoveToBeacon required about 4 million samples, however after some playing around I was able to reduce it down all the way to 102,000 (~40x reduction) with PPO agent. Mean episode rewards with std.dev filled in-between. Click to enlarge. A video recording of the agent performing on all six minigames is available online at: https://youtu.be/gEyBzcPU5-w. In the video on the left is the agent acting in with randomly initialized weights and no training, whereas on the right he is trained to target scores. To lead the way with reproducibility, Reaver is bundled with pre-trained weights and full Tensorboard summary logs for all six minigames. Simply download an experiment archive from the releases tab and unzip onto the results/ directory. Tensorboard logs are available if you launch tensorboard --logidr=results/summaries. You can also view them directly online via Aughie Boards. In this section you can get a birdseye overview of my plans for the project in no particular order. You can also follow what I'm currently working on in the projects tab. Any help with development is of course highly appreciated, assuming contributed codebase license matches (MIT). Reaver is a very special and subjectively cute Protoss unit in the StarCraft game universe. In the StarCraft: Brood War version of the game, Reaver was notorious for being slow, clumsy, and often borderline useless if left on its own due to buggy in-game AI. However, in the hands of dedicated players that invested time into mastery of the unit, Reaver became one of the most powerful assets in the game, often playing a key role in tournament winning games. A predecessor to Reaver, named simply pysc2-rl-agent, was developed as the practical part of bachelor's thesis at the University of Tartu under the supervision of Ilya Kuzovkin and Tambet Matiisen. You can still access it on the v1.0 branch. If you encounter a codebase related problem then please open a ticket on GitHub and describe it in as much detail as possible. If you have more general questions or simply seeking advice feel free to send me an email. I am also a proud member of an active and friendly SC2AI online community, we mostly use Discord for communication. People of all backgrounds and levels of expertise are welcome to join!